Women's Chevron Striped Infinity Scarf Only $2.95 With FREE Shipping With Prime! 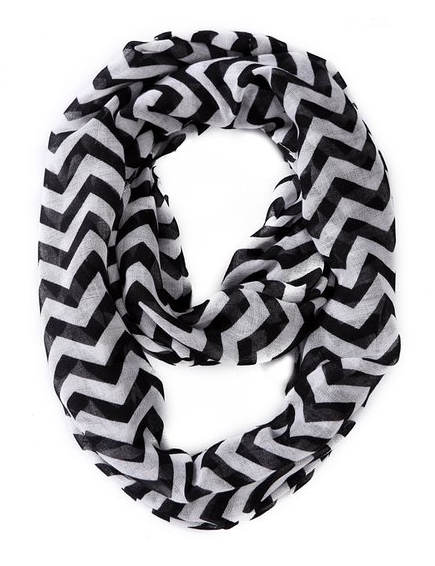 You are here: Home / Great Deals / Amazon Deals / Women’s Chevron Striped Infinity Scarf Only $2.95 With FREE Shipping With Prime! Women’s Chevron Striped Infinity Scarf Only $2.95 With FREE Shipping With Prime! Scarves and chevron print is hot right now and this HDE Womens Chevron Striped Infinity Scarf (Black/White) is perfect for the warmer months for those of us who love to wear scarves year-round! It is a steal at only $2.95 and with Amazon Prime, you get FREE Shipping! If you don’t have Amazon Prime, it is only $2.99 to ship making it a total of $5.94 shipped! Still a great deal! Make sure to sign up for your FREE 30 Day Trial of Amazon Prime and begin getting FREE shipping benefits right away!